Blacksburg Minors defeated Bedford East in the opening round of the Virginia Dixie Youth State Tournament. The State Tournament consists of seven district champions and the tournament host, for a total of eight teams. In a game that was scheduled to begin at 4pm, didn't get underway until 6:45 due to a major storm delay. Approximately 15 minutes before game time, a monster storm hit the area and flooded the fields. However, the excellent grounds crew and many volunteers helped to get the field ready. The Blacksburg game would not end until 9pm and there were two games left to be played (6pm & 8pm scheduled games). A decision was made to play all the games in order to keep the tournament on track. Bedford East struck first in the top of the first, scoring one run to jump out to a 1-0 lead. However, the Bruins stormed back and picked up 5 runs in the bottom of the 1st to go ahead 5-1. Luke Goforth led off with a single, followed by a RBI single by Ben Freel to tie the game at 1-1. Wesley McCoy hit a double to score Freel. Davis Roberson drew a walk, and Jacob Lucas hit a two out single to score two runs. Craig Weaver then had a RBI single to drive in the 5th run of the inning. Neither team would score in the 2nd inning. Colin Collver had a hit for Blacksburg, however. In the top of the 3rd, Bedford East scored two runs to tighten the game at 5-3. Blacksburg got out of a bases loaded jam through some great infield defensive play. In the bottom of the 3rd, Cole Epperely singled, McCoy walked, and then Roberson hit a RBI single, scoring Epperley. Blacksburg picked up a second run on a passed ball, making the score 7-3. In the top of the 4th, Bedford scored a run to narrow the margin to 7-4. In the bottom of the 4th, Blacksburg was held scoreless, but Grant Johnston had a single. In the top of the 5th, Bedford East tacked on a run to make the score 7-5. Luke Goforth came in to pitch with one out and bases loaded and was able to get out of the jam without any further damage. In the bottom of the 5th, Craig Weaver singled, Caden Croy was re-inserted and drew a walk, Luke Goforth walked, and Ben Freel hit a 2 RBI single to push 2 more runs across making the score 9-5. In the top of the 6th, Goforth faced 5 batters, striking out one, and kept Bedford East from scoring a run. Grant Johnston was the winning pitcher, pitching the first 3 innings. Davis Roberson pitched an inning and a third, while Goforth pitched 1 and 2/3 innings for the save. Offensively, Blacksburg was led by Ben Freel and Craig Weaver, who both had two singles. With the win, Blacksburg advances to the next round of the Dixie State Tournament and will face Prince Edward Farmville @ 6pm. 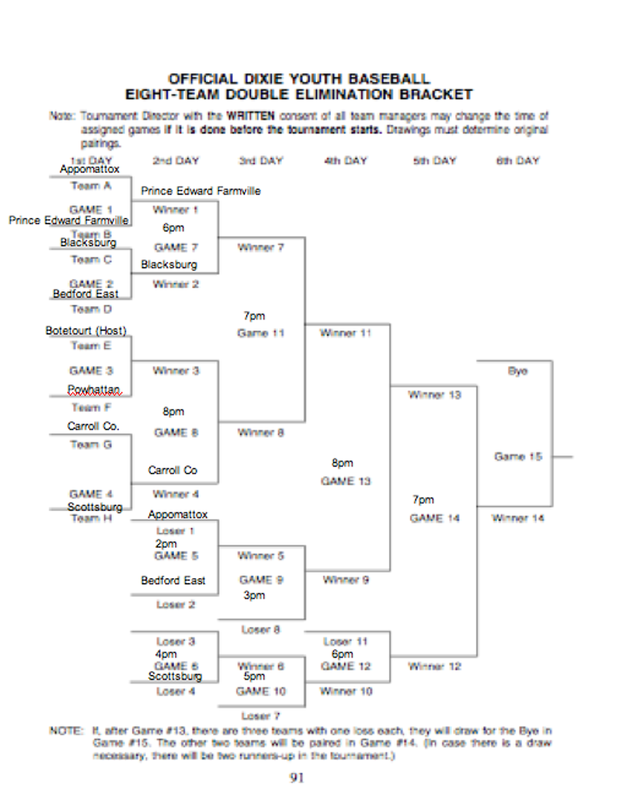 Prince Edward Farmville beat Appomattox 16-1 in the 2pm game.